Peter Mark Roget was born on January 18, 1779, so I thought it was appropriate to honor (observe, celebrate, commemorate) his 240th birthday. Roget’s personal story is rather sad (unfortunate, piteous, doleful) - he lost several close family members and suffered from depression for much of his life. Indeed, his lifelong habit of collecting words and making lists sprang from his struggles (endeavors, travails, sufferings) as a coping mechanism. But I always find it inspirational when someone makes something positive out of negative circumstances, and not only can I relate to Roget’s love of collecting words, but I love (adore, cherish, treasure) my thesaurus deeply. If you, like Roget and I, are a word collector, there are plenty of books (in addition to the thesaurus and the dictionary, of course) to keep you company. Here are just a few. The Right Word: Roget and His Thesaurus, by Jen Bryant and Melissa Sweet - A picture book biography of Roget, noting how the making of lists of words comforted young Peter, and emphasizing how important and satisfying it is to find the right word. 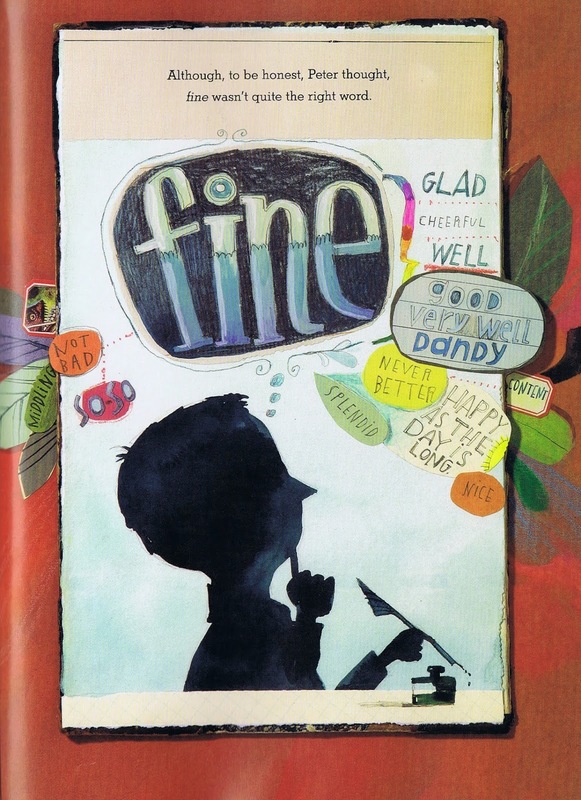 The mixed-media illustrations by Sweet are a lot of fun, too, incorporating all kinds of extra word lists. This is a Caldecott Honor book. I definitely recommend it for any kids who love words. The Word Collector, by Sonja Wimmer - About a girl who lives high in the sky and collects "funny words that tickle your palate when you say them, words so beautiful that they make you cry, friendly words that embrace your soul." When she hears that people are forgetting all the beautiful words, she sets out to give her words away to everyone who needs them, and by the time her words are gone, people have begun making and sharing new words. It's a nice story, but my main complaint is in the book design. The letters and words are so mixed up on the page, so mixed in with the exaggerated illustrations, that there is actually a script at the end of the book to tell you what each page is supposed to say. I would have liked the story better if I could have read it more easily. A Snicker of Magic, by Natalie Lloyd - A lovely middle grade novel whose main character is a girl who sees words wherever she goes, “shining above strangers, tucked into church eaves, and tangled up in her dog’s floppy ears.” The words aren’t really what the book is about, but they’re a fun element. We loved this one as a read-aloud. The Word Collector, by Peter Reynolds - About a boy who collects words on slips of paper and puts them in albums: “Short and sweet words. Two-syllable treats. And multi-syllable words that sounded like little songs.” When he accidentally drops his collection and the words get mixed, he starts making poetry, and finally “emptied his collection of words into the wind.” Curmudgeonly complaints about littering aside, I wanted to love this one, but didn’t quite. I can’t put my finger on why, so chances are that you may well adore it. It’s certainly worth a look. I leave you with a handful of delicious words that I’ve collected over the years. Feel free to look them up yourself, in the dictionary or the thesaurus.